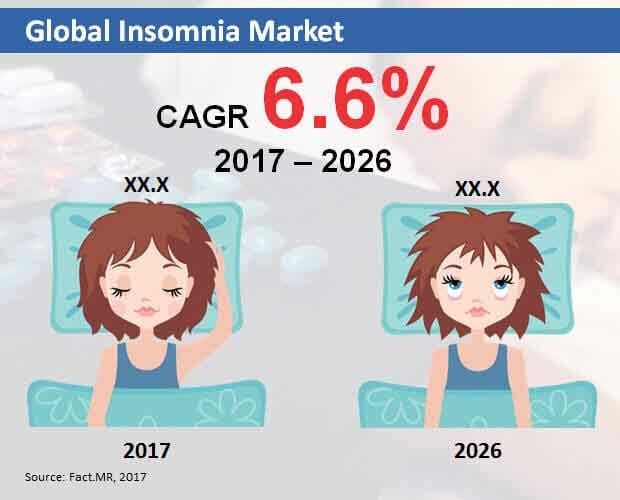 The global insomnia market is prognosticated in a publication by Transparency Market Research (TMR) to find players concentrating on the development of effective treatment methods with new drug formulations and continuous research and development investment. There could hardly be any drugs available that provide complete treatment of insomnia. This is expected to open the door to profit-making opportunities as companies come up with a series of drugs for short-term treatment, including zolpidem, trazodone, and tricyclic antidepressants (TCAs). The market sees strong opportunities for innovation and development due to lack of absolute treatment for insomnia. Pfizer Inc., Sanofi, and Merck & Co. are among key players of the market. TMR prophesies the global insomnia market to register a 6.6% CAGR during the forecast period 2017-2026. The market is anticipated to reach a valuation of US$4.0 bn by the completion of 2026. By sales channel, it could witness the rise of retail pharmacies and drug stores as a leading segment securing almost two-fifth of the total market share in the final forecast year. By region, North America is foreseen to take up the reins of the market until the end of the forecast period. In 2016, 70 mn adults in the U.S. suffered from insomnia, according to the Centers for Disease Control and Prevention (CDC). Increased incidence of insomnia is predicted to raise more demand for effective treatments in the near term. Rising number of insomnia cases could be a result of smoking addiction and excessive caffeine and alcohol consumption. There has been a high focus on the development of innovative sleep-inducing medical devices and new technologies that could help in reducing symptoms of insomnia. This could also help to improve insomnia therapeutics to some extent. Use of advanced technology to launch smart wearable sleep-inducers is projected to give a strong boost to the business of medical device manufacturers. Able to work with mobile apps, these devices are exclusively designed to help insomnia patients stay asleep for adequate period of time or fall asleep faster. The issue of cost sensitivity is envisaged to create imbalance in the international insomnia market, even though a handful of players offer branded drugs. In this regard, the market could see novel molecules and new cost-effective chemical entities being developed by drug manufacturers so that they could improve their revenue earned in the market. Soaring stress levels of working individuals and unnatural work timings in emerging regions such as Asia Pacific could create opportunities in the international insomnia market. Moreover, government initiatives to improve healthcare system are foretold to support market growth in the foreseeable future. Swelling healthcare expenditure in North America, on the other hand, could also propel growth in the near future.